From November 16 – December 11, 2016, the critically acclaimed show “The Christians” will be performed at Theater J, near Dupont Circle. The show runs approximately 90 minutes and discusses the importance of faith and its ability to unite or divide us and our communities. 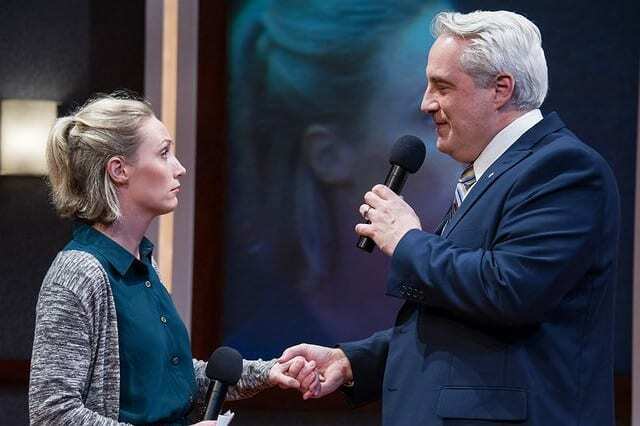 “The Christians” was developed at The Kennedy Center, and made its debut at the Humana Festival of New American Plays at the Actors Theatre of Louisville. When it was performed at the Playwrights Horizons in New York, it won the Outer Critics Award for Outstanding New Off-Broadway Play. “The Christians” was written by Lucas Hnath, and the Theater J production is directed by Gregg Henry, who directed “Sons of the Prophet” at Theater J during the 2015 – 2016 season. The cast comprises of 5 actors, Caroline Clay, Annie Grier, Michael Russotto, Justin Weaks, and Michael Willis. Despite the small number of cast members, the stage is filled by the talent that they bring to the small theater. Each day that the show is performed, it will feature a local D.C. choir including All Souls Church, Conception of Praise, Washington Performing Arts Adult Choir, Trinity Washington University Choir, Holy Comforter St. Cyprian, Refreshing Spring COGIC James E. Jordan Jr. Choir, and 11 others. To purchase tickets for “The Christians” please see the Theater J website.